Alison is still looking for this rabbit. Our beloved Superbun was stolen from a Costa Rican hotel room, and we are devastated. We miss him so much. He is a garden-variety tiny plush rabbit from a drugstore in Montreal, Canada. He was probably from a wholesaler and cost less than $10, but we can’t find a replacement. We believe he might have been a RUSS or APPLAUSE brand plush, after looking at many pictures of similar rabbits on-line. However, all the ones we found were 8 inches and longer, clearly too big to be our bunny. 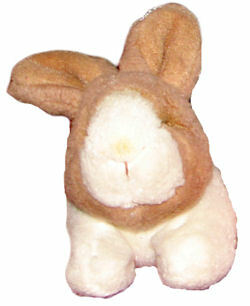 Small (5 inches maximum) crouching tan/brown and white plush bunny rabbit, black eyes, not beanie but stuffed, purchased at Jean Coutu pharmacy in Montreal, Quebec, Canada, in late 2003. One day my new boyfriend went to the pharmacy to get me a prescription, as I was having some health problems. We named him SUPERBUN because my boyfriend (now my husband) would fly him around the room like a superhero, which would make me smile no matter how rotten my medication made me feel! Five years later, Superbun and his little brother Jerome (a Ty beanie baby giraffe) have never spent a night away from our pillows. Superbun always traveled with my husband to keep him safe, and Jerome stayed home with me. His final adventure was Costa Rica. At the hotel, I tipped the chambermaid well, and she always took care to place Superbun and Jerome on our pillows after making the beds. One Sunday, on her day off, another maid cleaned the room and when we returned, Superbun was gone. It may sound silly, but we are so attached to our little guys. Anything that you and your wonderful site can do to help would be deeply appreciated. If you are still looking try searching under dakin as well. I find several of the right size and position but not the right color. Here is a plain brown one. ebay #	310313975253 Best Wishes! Thank you for your help. We never did find a bunny exactly like the original, but I did find one that’s pretty close. I’m still interested in finding the exact replacement, so I’ll check out Dakin.